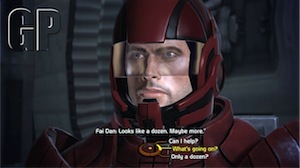 Mass Effect, the latest release from BioWare, is an interesting game. In some respects, it is one of the top games of the year, which is saying a lot with the likes of Bioshock and Call of Duty 4 out, but on the other hand, it has some pretty big flaws as well. Let me explain. First off - if you haven’t played a BioWare RPG before (like Knights of the Old Republic), you have to understand that their RGPs are not traditional RPGs. The best example of that is grinding. Grinding is when you take your characters out into the woods and spend a few hours raising their levels so you can beat some boss holding you back. BioWare RPGs don’t allow for this because they don’t have random encounters. This makes for the game focus much more on the story. You don’t have “side trips” for grinding. For folks used to traditional RPGs, this takes some getting used to - but the story focus makes for a much better experience in my opinion. Mass Effect continues this tradition and to great effect. The story (so far anyway) is incredibly interesting. I want to call it “Mature” - but I don’t want to imply it is anything like GTA. It is M rated - but more than that - the story just feels like it was written by smart, older geeks as opposed to something written for 12 year olds. I can respect that. It is the difference between Star Wars and the new Battlestar Galactica. Different audience - different tone. You get the idea. Your characters have 4 weapon slots. You can equip a different weapon in each slot. This lets you switch between 4 different types of weapons at a time. It also means you have to remember 12 sets of weapons for your party of 3. That’s not including grenades. If one character is trained well in shotguns and pistols and another in assault rifles, you have to keep this in mind and ensure your characters equip the best weapons for their skill set. Oh - and don’t forget skills. Up to 5 or so skills can be used by each character. So before going into battle, you get to choose between 12 weapons and 15 skills. It’s a bit much in my opinion. The last problem is the graphics. Again - this is both good and bad. The graphical design is great. But the actual implementation is a bit lacking. On my first away mission, I thought something was wrong with my TV. The screen was dark and murky. I fiddled around a bit but it didn’t help much. I also see “popping” from time to time - where textures will load in slowly or things seem to jerk a bit. I keep thinking that I’ve not configured something right - yet my other games play just fine. Again - the actual design is awesome. I love the all the designs I’ve seen so far - but the resolution/engine seems a bit buggy right now. So I know I complained about a lot - but trust me. This is a darn good game. I’m really happy to see BioWare in a non-Star Wars universe (I haven’t played Jade Empire yet). I was a bit worried about how they would handle their own IP, but they did a great job. I would definitely recommend picking it up.